An Arizona cop was publicly put in his place by a 12-year-old after he threatened to arrest her for filming him. This cop really picked the wrong kid to pick on. 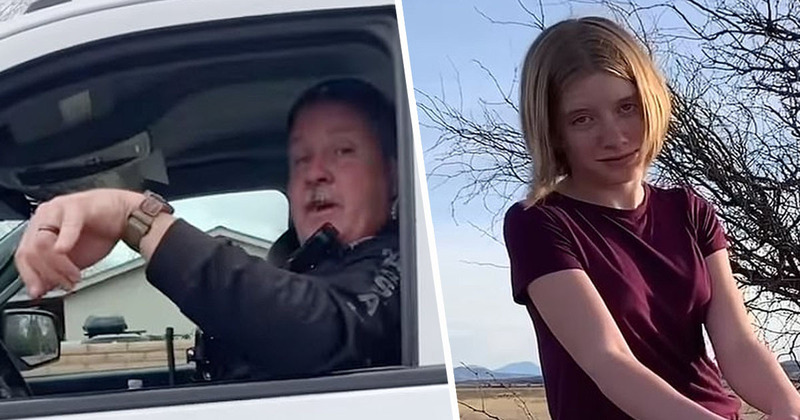 Marshal Joseph Patterson has been branded a bully after an incident between the cop and Hilde Kate Lysiak, a young journalist reporting from Patagonia, Arizona, was filmed and shared online. The clip was published to YouTube by the local paper, Orange Street News, which Lysiak both reports for and runs single-handedly. The 12-year-old from Selinsgrove, Pennsylvania, was out on her bicycle following a tip close to the Mexican border on Monday (February 18) when Patterson stopped her and asked for identification. Lysiak claimed she cooperated by identifying herself as a member of the media, and giving her name and phone number, she recalled later in her news report. I don’t want to hear about any of that freedom of the press stuff. Lysiak claims Patterson continued to threaten her with arrest, saying, ‘I’m going to have you arrested and thrown in juvey’. After he is said to have asked the young girl if she understood he could ‘have [her] arrested’, the video shows Lysiak asking the officer to outline exactly what she was doing which he deemed illegal. You can tape me okay but what I’m gonna tell you is if you put my face on the internet, it’s against the law in Arizona. While it is against the law for citizens to impede officers in their duties, there is no law which prohibits filming law enforcement doing their job, especially if they’re in uniform. The statute Patterson referred to applies to public information such as home addresses of law enforcement agents or judges. Patterson claimed he stopped Lysiak as he was worried about her safety amid reports of a local mountain lion sighting. Lysiak said there were other people in the area at the time who did not get stopped or questioned. Patterson then accused the girl of lying about going to a friend’s house before following his vehicle. The conversation ends with him threatening to contact her parents. In a statement on the town’s website, officials said they had numerous comments on the incident so reviewed the matter and ‘have taken action we believe to be appropriate for the situation’.